Former Seligman mayor Jason Raucstadt is in trouble with the law again. This time, Raucstadt has been charged with burglary in the first degree, property damage in the second degree and three counts of endangering the welfare of a child. According to the affidavit of probable cause, Washburn Chief of Police Doug Henry responded to an apartment on Pineville Road in Washburn on Tuesday, August 11. When he arrived, three children in the home said that Raucstadt had broken into the home, went into the kitchen, grabbed a knife and began threatening to kill their mother while waving the knife around. While in the apartment, Raucstadt took a DVD player that belonged to the mother, as well as a guitar that belonged to him. Raucstadt also allegedly pried the bedroom door open with the knife, damaging the door and door jamb. Raucstadt is currently on probation for DWI-alcohol and resisting arrest from 2014. He also has pending charges of non-support, two violations of order for protection, burglary in the first degree and domestic assault in the first degree. 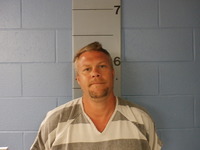 Raucstadt is currently being held in the Barry County Jail in lieu of a $50,000 cash-only bond. Raucstadt was employed with the City of Seligman as a maintenance worker from October 8, 2007, to November 17, 2010, until his employment was terminated and served as mayor from April 11, 2011, until he resigned on February 13, 2013.